Little Alain Giresse with the ball. He was only 5'4" tall, but a giant in this semifinal. Patrick Battiston is carried off the field after the cruel foul by Schumacher. Platini is checking up on him. The other French players are Tresor and Six. Karl-Heinz Rummenigge came on as a substitute and changed the scenario in this match. Here against Rocheteau. Uli Stielike in tears after missing his penalty in the shoot-out. Pierre Littbarski tries to console him and together they watch Schumacher save the attempt from Six. That save was necessary in order to keep the Germans in the game. Platini scores on his penalty in the shoot-out. His second in the game as he also scored from the spot in normal time. The 1982 semifinal between West Germany and France will always be brought up when people talk about classic games in World Cup history. It had everything. Attacking play, great goals, memorable incidents and a penalty shoot-out as the icing on the cake. The match kicked-off at 9:00pm local time with the temperature still in its high nineties. Both teams had had their problems prior to the semifinal. The French started poorly losing 3-1 to England in their opening game, but fought back and advanced through the rounds. They also improved the squad spirit by sending home Pablo Larios who allegedly was having an affair with Michel Platini’s wife! The Germans did not have that sort of problem in their camp, but several of their key players were suffering from a stomach virus. Coach Jupp Derwall also decided to rest his greatest star and European Player of the Year, Karl-Heinz Rummenigge for the semifinal. He was left on the bench nursing his knee-injury and would only be used if the team was in trouble. The team had also, like France, had a poor start to the tournament losing to newcomers Algeria in the first round, but in typical German fashion, the team recovered and eliminated the hosts Spain and England in the second phase to win a place in the semifinals. West Germany took the initiative and pushed forward from the start and had several chances to score within the first fifteen minutes. Pierre Littbarski hit the crossbar with a powerful free-kick from 25 yards. The little winger was the big discovery of the tournament and would later also figure in Germany’s 1990 World Cup winning team. After 17 minutes the same Littbarski took advantage of a rebound from goalkeeper Ettori and blasted the ball home through a crowd of players. France with their beautiful flowing football soon got back into the game when Dominique Rocheteau was brought down by Bernd Förster in the penalty area ten minutes later. Michel Platini sent Harald Schumacher the wrong way to equalize. Schumacher was going to be the decisive man in this match. He was a temperamental and very talented goalkeeper who benefitted from his aggressive style. He had broken every finger but two in his life between the posts according to a soccer magazine. In this semifinal he appeared violent against Didier Six and Manuel Amoros in the first half, but it wasn’t until early in the second half that Schumacher committed “the crime of the century” in soccer. French substitute Patrick Battiston had only been on the field for five minutes when Platini played a beautiful ball through to him. Schumacher clearly made no attempt to play the ball and crashed into Battiston with full power leaving him unconscious on the ground. Everyone waited for Dutch referee Corver to wave with the red card, but no card came up from his pocket. He completely ignored the foul and read it as an accident on a 50/50 ball instead and signalled for goalkick! Battiston was badly hurt and rumours said he lost three teeth and was supplied with oxygen to survive. Platini later said he thought Battiston was dead because he had no pulse and looked pale when he was stretched off. After the World Cup in one of France’s biggest newspapers, they had a poll about who the least popular man in France was. Schumacher won the poll with Adolf Hitler in second! 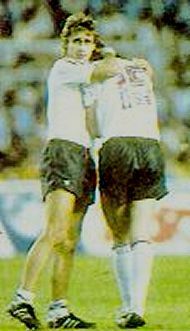 The spectators in Seville booed and whistled every time Schumacher got near the ball after that collision with Battiston, and French coach Michel Hidalgo was forced to use his second substitute. In 1982 only two substitutes were allowed. Both teams had chances to score the winning goal in the remaining half hour of normal time. Manuel Amoros’ effort from long range hit the crossbar right on full time and Paul Breitner’s shot from 20 yards was first partially saved by Ettori and then pushed away at the feet of Klaus Fischer in injury time. France looked to have the fresher legs in extra-time and took the lead after only two minutes with a cracking volley by their sweeper Marius Tresor following a Giresse free-kick on the right side. West German coach Jupp Derwall could not afford the luxury of having Rummenigge on the bench anymore. 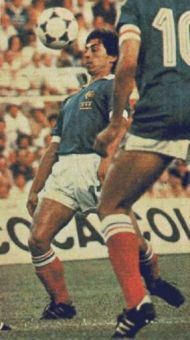 The half-fit starforward was brought on just a few minutes after Tresor’s goal and immediately made an impact on the game. A pair of fresh legs definitely was an advantage against the tired French defenders, but after 98 minutes a quick counter-attack took the Germans by surprise and Giresse scored with a great shot from the 18 yard line in off the post. At 3-1, the French players looked certain to have won the game. The crowd was 95% on their side and yelled and celebrated everytime a French player passed the ball to another. They kept coming forward looking for goal number four to really humiliate the Germans instead of sitting back on their two-goal advantage. Uli Stielike, the German sweeper, suddenly intercepted the ball in midfield amidst the French play and fed Littbarski on the left. His chip was met by Rummenigge who steered the ball home from close range pressured by French defender Janvion seconds before half time of extra time. Suddenly extra energy was injected in the West German team and France started to play more cautious than earlier. They now tried to hold on to their one goal advantage in the second half, but it took only three minutes for the equalizer to come. Rummenigge was once again instrumental in the build-up. Littbarski crossed to Hrubesch who headed over to Klaus Fischer who scored with a marvellous over-head kick. West Germany unbelievably had levelled the score. Fischer almost scored another goal minutes from time when his effort went an inch wide of the post. France seemed to be the happier team when the referee blew the final whistle. For the first time in World Cup history, soccer’s version of Russian roulette was needed: The penalty shoot-out. France won the toss-up and got that tiny edge of advantage of shooting first. Alain Giresse, who must have thought he sent France to the final with his 3-1 goal, would now face Schumacher again. He sent the German keeper the wrong way yet again. 1-0. Manfred Kaltz, the German captain, was next. He had a 92% success rate as a penalty expert in the German Bundesliga and did not let his team down. 1-1. Manuel Amoros and Paul Breitner both converted their penalties with ease. 2-2. Dominique Rocheteau scored for France, before Uli Stielike stepped up for West Germany. He played for Real Madrid at the time and had been voted best foreigner in the Spanish league. He was desperate to play the World Cup final in Madrid in his home stadium Santiago Bernabeu, but his weak shot was saved by Ettori. He fell down on his knees in despair and Schumacher went over consoling him and must have said something like:”Don’t worry, I’ll save the next one”. Didier Six now had a golden opportunity to put France 4-2 up and almost certainly send his country to the final, but Schumacher made a great save diving to his right. Cold as ice without smiling he pointed at Stielike with a body language that said:”I told you so”. Pierre Littbarski levelled it up at 3-3 with a good penalty near the top corner. Platini and Rummenigge both succeeded in converting their penalties which meant that the teams were level at 4-4 after the ordinary five rounds of penalties. Extra penalties were needed. Maxime Bossis volunteered to take France’s sixth penalty. His effort was wonderfully saved by Schumacher who chose to dive to his right corner for the fifth time in a row. Horst Hrubesch, the man who scored twice for West Germany in the European Championship final two years earlier, had the opportunity to send the Germans to the final. He sent Ettori the wrong way and scored with ease. The drama was finally over. The French players wept openly as they left the field, having had the Germans in their grasp both in extra-time and also in the shoot-out, without being able to finish them off. West Germany proved once again their remarkable strength in coming from behind and win. The World Cup history is full of late comebacks by the Germans and this match will rank up there with the very best, even though most neutrals were angered by the outcome. West Germany did not manage to overcome Italy in the final. Italy, who beat Poland 2-0 in their semifinal, looked fresher and could coast in to a 3-1 win with all the goals coming in the second half. The Germans were not able to mobilize the required energy to match the Italians who were not forced to use full power to beat Poland. France fielded a team with many reserves and lost the bronzematch 3-2 to Poland. Line-up: Schumacher, Kaltz, K-H Förster, Stielike, Briegel (Rummenigge), B.Förster, Dremmler, Breitner, Littbarski, Magath (Hrubesch), Fischer. Line-up: Ettori, Amoros, Janvion, Bossis, Tigana, Tresor, Genghini (Battiston)(Lopez), Giresse, Platini, Rocheteau, Six.